In “Leaving Las Vegas”—the movie version—Nicolas Cage left the desert destination famous for gambling and glitter through a whiskey bottle. 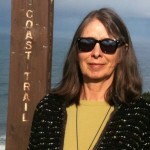 My sister Janet and her husband Will are departing more conventionally—they’re moving. But not for a year. In the meantime, they’ve decided to get their fill of the after-dark entertainment that draws millions of visitors each year but hasn’t been part of their life as locals living and working well beyond the bright lights. They invited us to join them for a weekend on the town. “You can wear sequins or jeans—anything goes,” texted sister Janet. After driving eight hours from our home near Lake Tahoe, we were ready to stretch our legs. 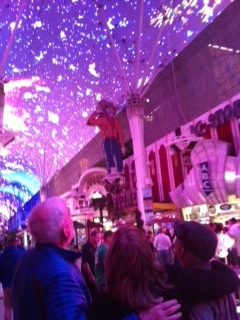 Will suggested Fremont Street in downtown Las Vegas, considered the area’s second most famous street after the Strip. 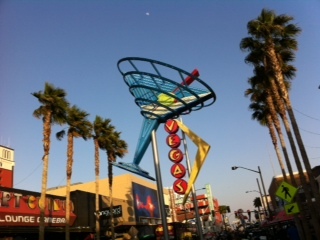 The neon sign collection that long ago earned Fremont Street its “Glitter Gulch” nickname gained substantial wattage in the mid-1990s when four blocks east of the Plaza Hotel & Casino were transformed into an open-air pedestrian zone. Capped by a canopy with more than 12.5 million synchronized LED lamps and 550,000 watts of sound, what’s called “The Fremont Street Experience” delivers free eye- and ear-popping light shows hourly after dark. Five years ago several adjacent blocks were transformed into FEED—the Fremont East Entertainment District—through a partnership among the Las Vegas Redevelopment Authority and area property and business owners. Sans canopy but boasting retro-looking neon sculptures, the streetscape is lively with venues like the Beat Coffeehouse, Insert Coin(s) game bar, Emergency Arts creative collective and Don’t Tell Mama piano bar and cabaret. We began our own Fremont Street Experience in Fremont East at the vintage El Cortez Hotel & Casino, where my road-weary husband Joe planned to ease into the Vegas vibe at a penny slot machine. Turned out no easing was required—with a sixty cent bet, he won $601 and change before the cocktail waitress had time to take his order. Because it was opening weekend of NCAA March Madness, we had plenty of company while strolling Fremont Street, past stages with live music, bikini-and-boot-clad women dancing on bar tops, and drink vendors selling giant alcoholic slushies. We took a pass on the deep-fried Oreos and Twinkies, and weren’t even tempted to read the menu at former Mayor Oscar Goodman’s restaurant, Beef*Booze*Broads. Instead we opted for a spicy Thai feast at LeThai, where the outdoor patio is the best spot to dine on delights like 3 Color Curry and Spicy Eggplant stir fry. Afterward, it was show time as the Fremont Street canopy came to life with a kaleidoscopic, throbbing rendition of “Crazy for You” in honor of Heart’s induction this year into the Rock and Roll Hall of Fame. When the performance ended, the NCAA bracket was projected on the canopy so wandering gamblers could track their teams. The drive back to our quiet neighborhood home base led past the 61-acre Symphony Park, a former brownfield site that’s being developed into a sustainable urban neighborhood. Here the art deco Smith Center for the Performing Arts is home to the Las Vegas Philharmonic and Nevada Ballet Theatre, and a showcase for international cultural talent. Also prominent in the park is the Cleveland Clinic Lou Revo Center for Brain Health—a sculptural masterpiece designed by Frank Gehry that burns bright blue after dark. For kids, the DISCOVERY Children’s Museum is a treasure trove of interactive learning activities. Luxe lodging will arrive in Symphony Park in the future, courtesy of The Charlie Palmer, a 400-room nongaming resort hotel with a 10,000-sq.-ft. spa—and of course, divine cuisine options. Cirque du Soleil performed “Lucy in the Sky with Diamonds” during “LOVE” at The Mirage. Photo courtesy of The Mirage. The dazzling centerpiece of our Vegas adventure was a Cirque du Soleil performance at the Mirage casino called “LOVE,” a wildly innovative fusion of acrobatics, aerial gyrations, freestyle dance, quirky props (including real VW bugs) and magical characters set to a Beatles soundtrack. And not just any soundtrack—this two-time Grammy Award winner was crafted from Abbey Road Studios’ master tapes by none other than Sir George Martin—who first signed the unknown quartet to a record contract in 1962—and his son Giles. This was our first Cirque du Soleil experience and it was truly LOVE at first sight. (I’m glad I wore sequins instead of jeans.) We planned on wandering down the Strip after the performance but many casino exteriors were dark as part of Earth Hour 2013, supporting protection of our planet. 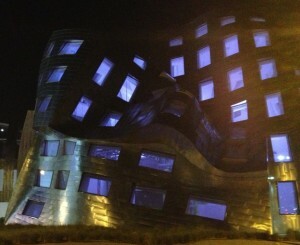 Even fully illuminated, the Strip would have been anticlimactic after the Beatles, Cirque-style. The next day we kicked back with lunch and a llama encounter at the Springs Preserve, a 180-acre sustainable oasis within eyeshot of the Strip skyline. On the National Register of Historic Places since 1978 and open to the public since 2007, the preserve blends desert living-themed museums and interactive exhibits with botanical gardens and an interpretive trail network. Kids’ day camps, weekend nature workshops and animal shows (hence the llama) are all part of this soothing antidote to the surreal side of Las Vegas. And then it was time for leaving Las Vegas—not knowing if there would be a return engagement once we no longer have family there. During the drive home we agreed that the weekend’s blend of bright lights glitter and daylight desert beauty had been the perfect farewell tour. Great article Julie. You are a talented writer. Thanks for the great trip, Julie! Love your writing!